Some time ago I attended the event “Innovatie management op het Microsoft-platform” where I could experience a cool intersection of open innovation and information technology. 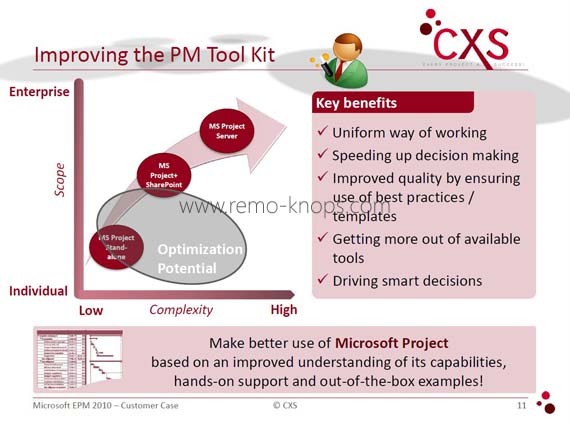 CXS B.V., a joint venture between Campana & Schott and Corporate Project Solutions, shared a case study at a marketleading pharmaceutical company, where they’ve build an innovation management solution build up-on Microsoft Project Server 2010. A formal definition of open innovation is discussed in the article “What is open innovation“. I’ve argued there that the term open innovation has innovated itself, with a more recent view on services focused innovation. The open innovation funnel is a visual model that describes the inflows and outflows of knowledge. The starting point on the left is the ideation phase, with lots of different ideas and knowledge sources. These ideas travel different routes through the funnel, however the result is going to market in an actual product or service. Keep the open innovation funnel in mind, because it will help you understand the different building blocks of the innovation management solution build by CXS B.V. The most interesting part for me was the connection of different IT systems (like the pieces of the puzzle) including the SAP ERP systems with financial databases. In this PowerPoint slide you can see each of the IT system building blocks as modules in a Microsoft SharePoint environment. The open innovation funnel has stage-gated characteristics given the different building blocks of IT systems. A highly interesting scientific paper about stage gated innovation funnels is How companies are reinventing their idea-to-launch methodologies (Cooper, 2009). The formal system architecture is shown in the PowerPoint slide above. First a core platform of Windows Server 2008 and Microsoft SQL Server. The second layer on top of the core platform consists of Microsoft Project Server 2010 and Microsoft SharePoint 2010. The ability to create (custom) SharePoint workflows suits the stage gated model perfectly. The third layer is the front-end to the end-user and consists of Microsoft Project 2010, a SharePoint Portal and a Microsoft Project Web App. Web Apps are known from Microsoft Office 2010, where the Word-, Excel-, PowerPoint- and OneNote Web Apps allow you to create documents from your browser onto your SkyDrive cloud storage (and edit them). 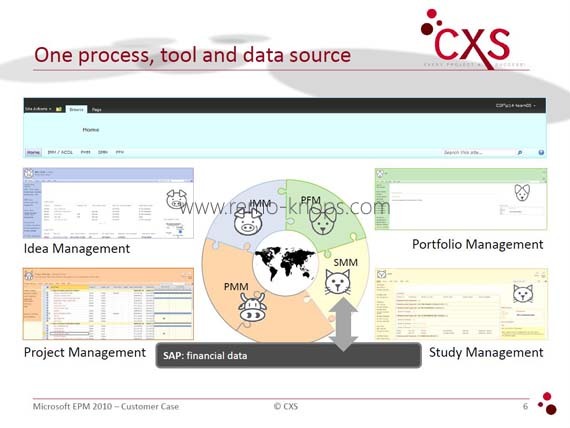 In the first PowerPoint slide you could see the innovation management solution also consists of a connection with financial databases within SAP. Remark that a lot of large international firms use SAP technology for Enterprise Resource Planning (ERP). Perhaps less known is the fact that Microsoft and SAP have a strong partnership for more than 20 years with one common goal: Create customer value. 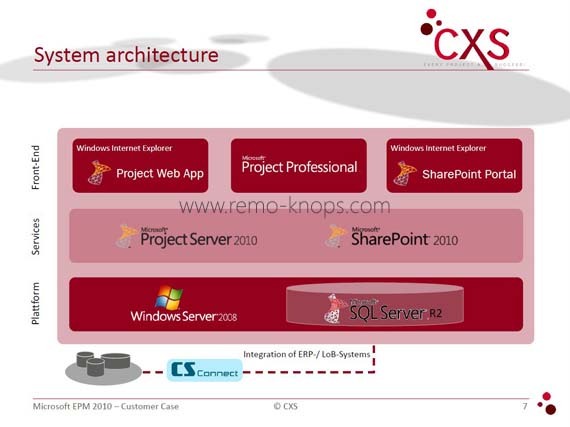 However in the solution architecture you can see that CS Connect facilitates the integration of the Innovation Management solution based on Microosft Project Server 2010 with the (financial) databases in SAP. You can read more about CS Connect and its features in the following CS Connect Brochure. 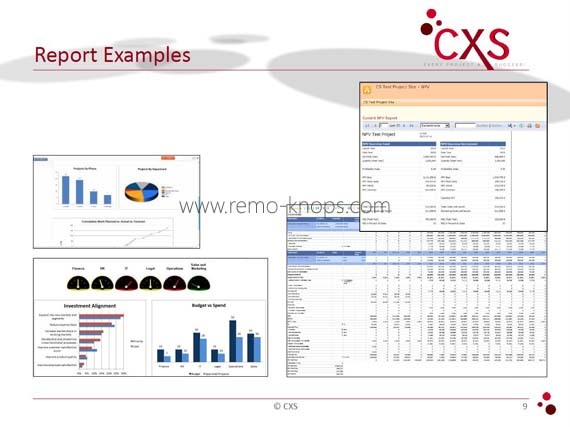 CXS B.V. has added extra reporting modules to Microsoft Project Server in order to provide the neccesary management tools for Project Managers and Portfolio Managers. The whitepaper Reporting with Microsoft Project Server 2010 is a must-read when you want to learn more about this aspect of Microsoft Project Server. It is really cool to see an innovation management solution that is based on Microsoft Project Server 2010, that supports the complete life cycle of a pharmaceutical product (from idea to realization). 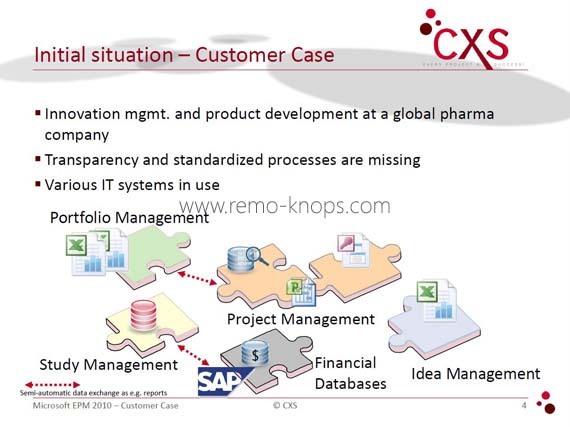 According to the CSX team has this innovation management solution shortened time to market of pharmaceutical products and lowered the corresponding costs. The innovation management solution has helped to increase interaction and transparency between the different departments that each add their piece of value to the end product. Personally I do see similarities with the open innovation funnel, so I could see scientific theory and practice coming together in a single solution. Furthermore there was a great and open discussion with the different project managers and innovation managers who visited this TechNet Masterclass and the people from CSX B.V. who actually build this innovation management solution. Overall it was highly interesting to see an end-to-end innovation management solution build with Microsoft Project Server 2012, Microsoft SharePoint 2010 and other technologies from the Microsoft Platform. I have a long desire to work with Microsoft server and Project. That’s why I try to learn these. Your information will be helpful for me.